The SPAR South Africa women are gearing up for their January tour to Switzerland and Czech Republic where they will play ten test matches. With the focus on that, the Psi All-Star series has been an excellent opportunity for the ladies to train and play together as they build towards the tour. On the third night of the series SPAR South Africa team took the game to their much-fancied opponents and twice took the lead deservingly through Kelly Reed and then again through Jessica Lardant. But as good as South Africa were in the first half, the internationals kept fighting back with Janne Muller-Wieland and Kiki van Wijk pulling the strings. At half-time it was 2-2 thanks to Kiana Cormack from a stroke and Marlena Rybacha from a penalty corner. If there was ever a performance to epitomize what an All-Star is, Rybacha, the Polish captain, produced it in the second half. Her no nonsense all action approach delighted the crowd and her player of the match performance was crowned with her own hat-trick. To settle the result Allison Meeke, a world cup silver medallist, and Muller-Wieland got late goals to add gloss to a fantastic match of indoor hockey. There were many positives for coach Lennie Botha. His team contested the match brilliantly in the first half and created some great opportunities that the World Class Alexander Heerbaart. The form of some of the youngsters in Jessica Lardant, Jamie Southgate and Tegan Fourie is looking good, while Cindy Hack is arguably playing the best hockey of her life. Her connections with Kelly Reed are sublime and something the internationals have taken note of. The International Hockey Federation has announced that every single match from the main hall at the Indoor Hockey World Cup 2018 will be live-streamed, free to air, on FIH's YouTube channel. Having previously announced a 15 man squad for the FIH Indoor Hockey World Cup next year, today SA Hockey is pleased to announce the final 12 players for the SA Indoor Hockey BlitzStoks, powered by Tops at SPAR, which will head to Germany in February to take on the World. Matthew Fairweather, who has captained the team since the last Indoor Hockey World Cup, will once again be the man asked to lead the team. This will be Fairweather’s second World Cup after featuring at Leipzig in 2015. In 2015 the BlitzStoks finished in 11th place at the World Cup, after defeating Canada in the playoffs, but featured a largely inexperienced squad with most players only having a handful of caps from the African Indoor Hockey Cup of Nations. For 2018 the BlitzStoks will have significantly more experience at their disposal with Chris McCathie, Richard Curtis, Justin Domleo, Jarryd Jones and Mo Mea all joining Fairweather at a second World Cup. The experience of having played at the previous World Cup will be a massive benefit for the squad and something that coach Pierre le Roux has put immense confidence in. Experience will also be provided in the form of Wade Paton, a man who counts the Olympic Games on his hockey resume and further complimented by Jethro Eustice, who featured for South Africa at the Commonwealth Games and the FIH Hockey World Cup. The consistent Robin Jones, a man who has won the African Cup of Nations in both Indoor and Outdoor Hockey alongside another teammate Reza Rosenberg, also add to a team with an incredible bond with one another. Ryan Julius and Rusten Abrahams were also part of the South African Men’s side that just won the African Hockey Indoor Cup of Nations in Namibia and the two youngest members of the squad offer an exciting offensive prospect for the BlitzStoks to utilise in Germany. The group of players assembled have the right makeup to achieve South Africa’s best ever finish at an Indoor Hockey World Cup. 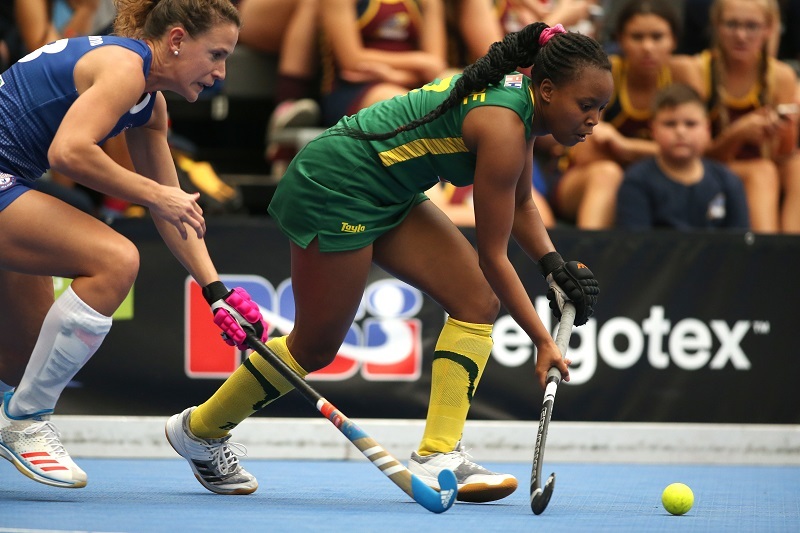 They have all been part of the SA Indoor Hockey structure over the past three years and have been exposed to many opportunities with each other at the various PSi Nationals. They will also have a further opportunity together when they play in the PSi Showdowns on 9, 10, 12 and 13 December in Cape Town. The SA Indoor BlitzStoks, powered by Tops at SPAR, will be heading to Germany in February 2018 to take on the best in the World at the FIH Indoor Hockey World Cup. The Men earned their spot with an outstanding victorious display at the African Hockey Indoor Cup of Nations in Swakopmund earlier this year. The 14 man squad, announced today, will take part in the All Stars series at the Pro Series Indoor Nationals in December, before a final 12 is selected for the FIH Indoor Hockey World Cup. Matthew Fairweather, who captained the team at the World Cup qualifier, returns to the squad after missing the All Stars series in July. Ryan Julius and Reza Rosenberg also missed out on that series while on commitment with the National Outdoor Team at the World League Semi-Final and they are also recalled. Ryan Julius had finished top goal scorer at the 2017 SA Hockey Indoor IPT. Another star from that tournament was Jethro Eustice, who won player of the tournament, who will be key to the BlitzStoks aiming for their highest ever World Cup finish. The goalkeepers will be the two goalkeepers that went to the previous World Cup with both Richard Curtis and Chris McCathie doing enough over the past three years to secure their place on the plane to the All-Star Series in Cape Town. Some of the other seats on that plane will be taken by players who have been in the system in the last three years including Olympian Wade Paton, reliable (belated birthday boy) Robin Jones, world star Justin Domleo and the exciting young talent Rusten Abrahams. The IPT that took part in Durban played a key part in the selector’s decision making, in line with selection policy for SA Hockey, which saw Julian Hykes and PG Geldenhuys work their way into the selector’s minds with a brilliant tournament that saw Southern Gauteng win another silver medal. The last two places in the 14 man squad were filled by Jarryd Jones, who has responded to missing out on the World Cup Qualifier with some scintillating form, and Craig Haley, who has shown over and over again that he knows how to find the back of the net. This meant that there was no place in the side for Keagan Robinson, who has been ruled out by the selectors after he tore his ACL just before IPT. The South African men’s indoor hockey team has been named to face a strong PSi International All Stars line-up in the four-match Denbeys Indoor Series in Durban and Pietermaritzburg next month.